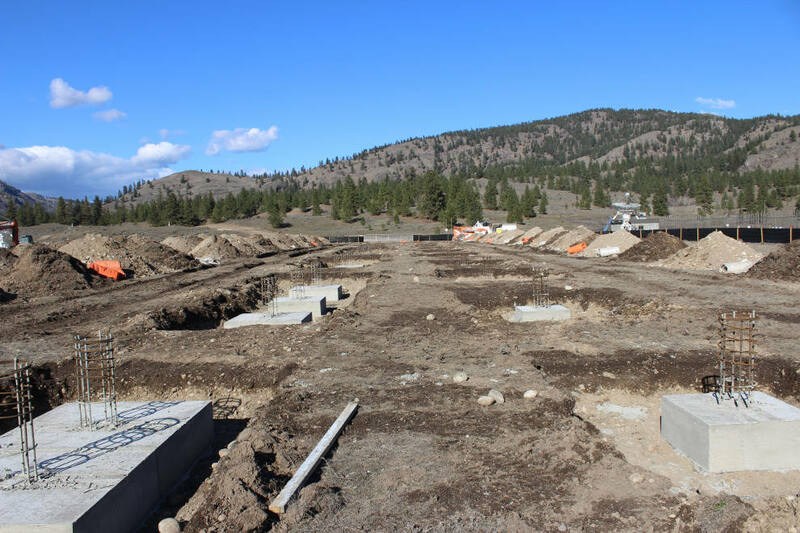 A view of the CHIME site from the south. Left to Right: CHIME, the John A. Galt 26 m telescope, the CHIME Pathfinder. Credit: NRC. Sometimes, ‘it takes a whole village to raise a child’, in this case, it takes most of Canada’s radio astronomer community to build a telescope. In a collaborative effort between University of British Columbia, McGill University, University of Toronto, the Perimeter Institute, the National Research Council, the Dominion Radio Astrophysical Observatory as well as collaborators across North America, a radio telescope named the Canadian Hydrogen Intensity Mapping Experiment (CHIME) will attempt to answer some critical cosmology questions. What is dark energy? Why is the universe expanding? These are some of the questions that astrophysicists are still grappling with. 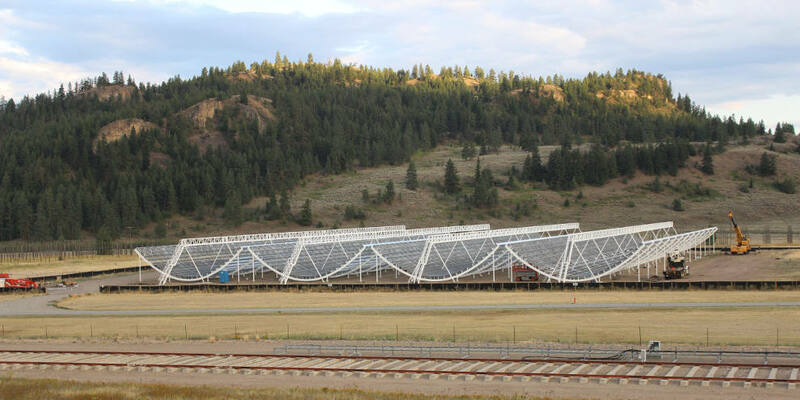 This $16 million telescope which had principal funding from the Canadian Foundation for Innovation is located at the Dominion Radio Astrophysical Observatory, near Penticton, British Columbia and operated by the National Research Council of Canada and is now Canada’s largest radio telescope. Within CHIME’s first week of observation, we should have detected more FRBs than the entire history. Prof. Keith Vanderlinde, University of Toronto. CHIME consists of four side-by-side U shaped half cylinders of metal mesh reflectors, each 20m by 100m. The larger a telescope’s collecting area, the more data it can collect. 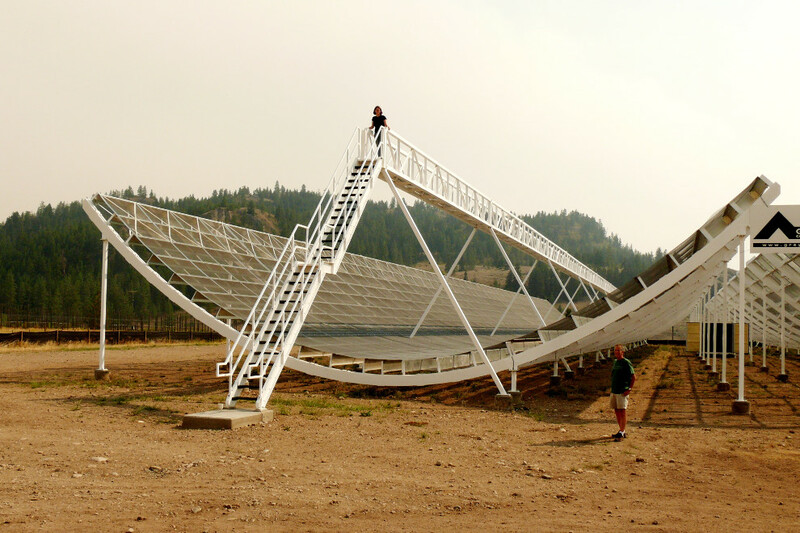 Due to its design, large collecting area, and a wide observational bandwidth, CHIME can see a large portion of the sky and can collect a few thousand times more data than any other radio telescope. To understand the data collection rate through CHIME, picture the data going through all of the world’s current mobile networks. This is quite an achievement considering that in CHIME’s early proposal stages about seven years ago, this technology did not exist. CHIME’s main goal is to map the hydrogen over a large fraction of the observable universe. The data collected as digital signals will be turned into three-dimensional maps of hydrogen density. This will allow cosmologists to measure the size and distance between galaxies and other large structures in the universe. They will then try to understand how these objects have changed over billions of years and how the universe is expanding. Laying concrete supports for CHIME cylinders. Credit: NRC. Laura Newburgh and David Hanna prepare to install cassettes with antenna and amplifiers attached on the focal line. Credit: NRC. CHIME in a late stage of cylinder construction. Credit: NRC. CHIME Telescope at night. Credit: CHIME. Dr. Keith Vanderlinde, an experimental cosmologist with the Dunlap Institute told SpaceQ in an interview that “it’s a few step problem. First, we map where all the structures are. Second, we figure out how the expansion is going. Third, we figure out what that implies for dark energy”. There are the most important yet puzzling questions in cosmology. One of the unique aspects of this telescope is that it has no moving parts. 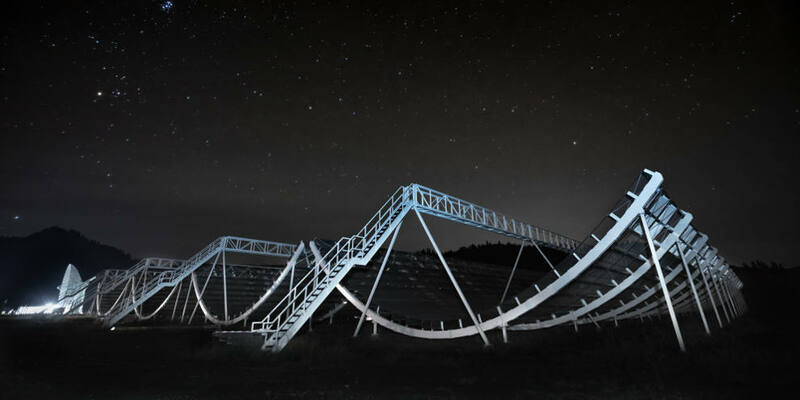 CHIME is designed to do its mapping in a lower resolution than many other telescopes, which in return allows it to survey an extremely large volume of the sky at large scales. Scanning the sky 24/7, CHIME will gather large amounts of data that will not only help in understanding the expansion of the universe, but also provide astrophysicists with a vast amount of data for researching other mysterious phenomena, such as pulsars and Fast Radio Bursts (FRBs). The first FRB was discovered accidentally in 2007 when Duncan Lorimer and David Narovic were looking at pulsar archived data at the Parkes Observatory. Only a few dozen FRBs have been detected since. The fact that they are still detectable, but not within our own galaxy, suggests they must be very bright. These bright bursts are “usually things that are cataclysmic and explode once and they’re done – except now we have seen FRBs repeat!” says Dr. Shaw. Intense radio bursts usually suggest explosions, collisions, or collapses. However, scientists have now seen a fraction of the FRBs repeat, which makes them even more mysterious. What is causing them and what is responsible for this? The beauty of a large radio telescope surveying a big volume of the sky 24/7, is that it can detect FRBs in the tens of thousands, which is more than any other telescope. “Within CHIME’s first week of observation, we should have detected more FRBs than the entire history,” says Dr. Vanderlinde. Having a larger database of these FRBs will help astrophysicists map out where they are in the sky and how big their explosion is, which will further tell us how far they are. They will also be able to determine what fraction of them repeat and how often they occur. Do they belong to one group of objects or multiple ones? Another spin off from CHIME’s data is to study pulsars in more detail, since it has the ability to monitor all pulsars in the northern sky. When massive stars go supernova, they leave behind small compact cores that spin rapidly and emit blips of radio energy. Pulsars are great celestial timekeepers, and astronomers use them as clues. They use them to measure cosmic distances, search for extrasolar planets, and study extreme states of matter. Astrophysicists will use the large collection of data that CHIME will have on pulsars to try and detect gravitational waves in the galaxy. Some other radio telescopes around the world such as Arecibo, Green Bank, and Parkes telescopes, only spend a fraction of their time searching for pulsars and FRBs. CHIME is truly unique in the sense that it will collect a large amount of data on FRBs and pulsars, while mapping the hydrogen in the universe. HIRAX (Hydrogen Intensity and Real-time Analysis eXperiment) in South Africa and the TIANLAI Project in China are two other efforts in understanding dark energy and expansion of the universe. However, both of these projects are still in proposal and funding stages. CHIME is the first telescope Canada has built on its own in a long time and shows how a country with a moderate science budget can make scientific advances. This experiment has been training many graduate students and postdocs, as well as involving a large fraction of the Canadian radio astronomy community. CHIME has enabled a big funding boost for radio astronomy in Canada and has attracted collaborators from all over the world. The nominal experiment duration is five years, but scientists hope to be able to answer some critical cosmology questions before then. Sara is a planetary geologist and science communicator with a passion for sharing the wonders of the universe with the public. 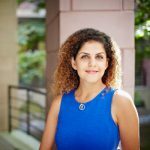 Sara started writing for SpaceQ in September 2017.